The Network: URGENT: Galilee Basin Mines impact on water : Statutory right to groundwater for mines proposed to commence! URGENT: Galilee Basin Mines impact on water : Statutory right to groundwater for mines proposed to commence! Statutory right to groundwater for mines proposed to commence! The loss of your public rights of appeal on underground water licences for mining companies. This amendment affects a significant amount of our underground water. The proposed Alpha and Kevin’s Corner Coal Mines alone would involve taking an estimated 176GL, or 70,400 Olympic swimming pools worth of underground water over 30 years. Currently mining companies have to apply to get a water licence, the application is publicly notified and then submitters (for example graziers or community groups concerned about water) have the right to appeal the decision on the water licence to the Land Court. These community rights would be lost if the proposed amendments are commenced. Our current Ministers want this removal of rights to go ahead! We support the positive changes WROLAA introduces – including obligatory make good agreements (although with some improvements needed), cumulative impact management, adequate monitoring and reporting obligations – but let’s not lose community appeal rights with respect to water licences. We need full public scrutiny of the impacts of major mines on groundwater. Removing water licence requirements seriously undermines that scrutiny. 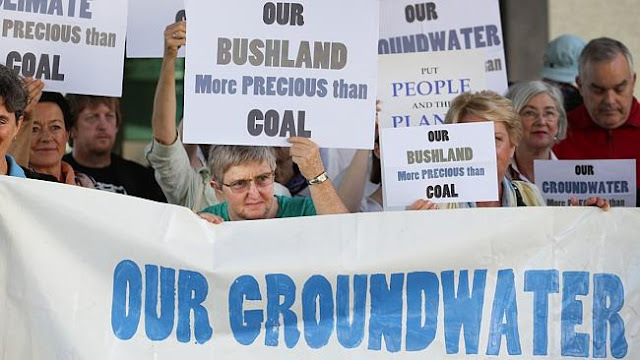 The decisions made by the Land Court in cases like Alpha Coal  and other Galilee Basin mines assume there will be later public scrutiny of an application for a water licence and the potentially major impacts on groundwater. And it’s simply unfair to change the rules when projects are part way through assessment and when citizens have made decisions as to whether to participate based on an existing array of rights. Even for development applications for shopping centres, our legal system provides the community with submission and appeal rights to the Planning and Environment Court for independent merit assessment. Impacts to our precious groundwater by large scale mining activities deserve the same scrutiny against community concerns. It’s contrary to Labour statements, as quote above. This State Government has further committed to open, accountable, transparent governance. This move is contrary to those commitments; silencing those concerned with impacts to groundwater in Queensland. Help save our groundwater resources! 1. Spread the word – share this news and why it is bad with your networks. 2. Speak to your local parliamentarian about this issue and tell them what you think. 4. Keep an eye on EDO Qld Facebook, Twitter or website for updates. “The Water Reform and Other Legislation Amendment Bill 2014 takes the errors of the Murray-Darling Basin and seeks to repeat them by facilitating the over-allocation of water for large ‘coordinated projects’ and mines. This legislation passed while 75 per cent of Queensland was drought declared and landholders are struggling to find water. The Opposition also does not support make good arrangements being dependent on a resource company coming to the conclusion that they have impacted on a landholders’ water bore. If water is extracted on an unsustainable basis from the Great Artesian Basin it will be lost forever. Apparently their position has changed. We can’t allow this to go ahead. Water Act, s206(4)(i) and Water Regulation, Sch 2, allows a holder of a mineral development licence or mining lease (or listed entity) to apply for a water licence. Water Act, s208 provides for public notice of water licence applications (limited exceptions to public notification in s209). For people who have made a properly made submission there are rights of internal review (s862(1)(a)) and appeal to the Land Court (s877(1)(b)). Hancock Coal Pty Ltd v Kelly & Ors and Department of Environment and Heritage Protection(No. 4)  QLC 12. WROLAA s11 proposes to insert Chapter 12A Part 1 in the Mineral Resources Act which includes s334ZP ‘Entitlement to use underground water’ and s334ZR associated authorisation. WROLAA s10 proposes to delete s235(3) of the Mineral Resources Act which states there is no entitlement to water. Queensland Labor, Saving the Great Barrier Reef: Labor’s plan to protect a natural wonder, January 2015. Letter Tim Mulherin former Labor MP to Kate Dennehy, Lock the Gate, 22 January 2015.